This past November, my husband Pablo was diagnosed with prostate cancer. Last month, he had surgery to remove the cancerous part of his prostate. 6 years ago, after surgery to remove a massive brain tumour, Pablo underwent brain radiation because of some abnormal cells discovered post surgery. Both my parents are cancer survivors. The Mesothelioma and Asbestos Awareness Center is working during the month of February to help spread the word about a very important cause: Cancer Prevention Month. Personal health can sometimes fall by the waist side for other things for those who are “too busy”. Healthy choices and resolutions start to dwindle, and you can actually be putting yourself at risk without even realizing it. 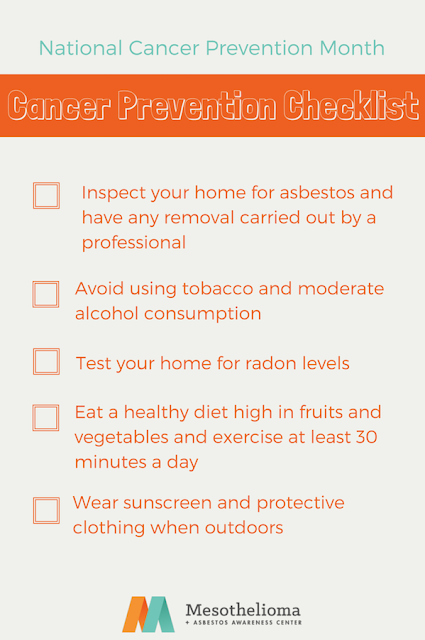 That is why the MAA Center compiled a checklist of easy prevention tips that you can practice everyday in order to maintain your personal health and down the line prevent certain cancers from developing. Regular exercising in any way, for 30+ minutes a day can help get your heart pumping and prevent weight gain. Whether you’re walking, dancing, scuba diving, or vacuuming, any bit helps! Avoiding tobacco products and inhaling secondhand smoke can decrease your chances of developing lung cancer. Routine medical care such as mammograms and colonoscopies are crucial for those who are aging gracefully and want to remain healthy. Be sure to bring up any noticeable differences with your doctor. With cancer being the second leading cause of death, early detection can make a huge difference and increase the amount of survivors. An important tip highlighted on this checklist is to get your house inspected for hidden toxins such as asbestos and radon levels. Many people do not know that asbestos has still not been banned in the U.S. or Canada, and is directly linked to ​the rare cancer mesothelioma​. It is so important to make sure to contact a licensed professional for abatement if you want to ensure that these toxins are handled properly. These cancers are most of the time preventable if you take the right measures (private psychologist london). Live a preventative lifestyle and keep your family safe and healthy this month and every month of the year! Start taking the right steps toward your own health and the health of those you love. Cancer Prevention Month is all about awareness and the fight against cancer!